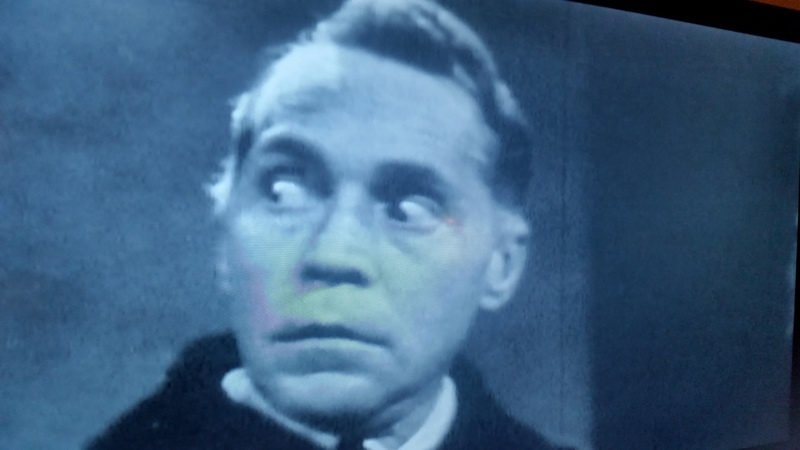 When the site Finding Franchot decided to spotlight the actor with a blogathon, I thought I’d take the opportunity to focus on three performances from the later portion of his career in the medium of television. While I’ve seen some of his film work, I don’t often think of him unless chatting up the 1935 version of Mutiny On the Bounty, Joan Crawford castoffs or the damaging fight with Tom Neal over the hand of Barbara Payton. I should also draw your attention to the film Phantom Lady which I have featured here previously that is well worth the effort to catch up with if you already haven’t. Clearly a live television broadcast, this tale feels very much like an early influence on the anthology films that Amicus would produce in the late 60’s and on into the 70’s. Our ghastly tale of murder takes place in an antique shop in London of 1880. It’s actually an adaptation of a Robert Louis Stevenson penned tale. Banging on the door of the antique shop after closing hours, Tone muscles his way past the maid and demands to see the owner, hawk nosed Francis Compton. The two will verbally spar allowing the viewers to realize that Tone has frequently brought stolen goods into the shop for cash. Flashing a dagger, Tone follows Compton about the store as the shop keeper demands he leave until Tone tells him that on this night he’s a buyer. Edgy and nervous, Tone does indeed plunge the dagger into the dealer’s chest leaving him dead on the floor. Voices? Yes Tone begins to hear them and when a knock occurs at the door, a returning patron will know all there is to know about Tone’s life and his misdeeds. Satan himself has shown up in human guise to push Tone a bit father down the path of evil doings. There’s still the maid to be dealt with. I love the fact that the copy I have of this comes with the sponsors break in the middle of the episode hawking spark plugs via a spokesperson and some cartoon footage to go with his message. 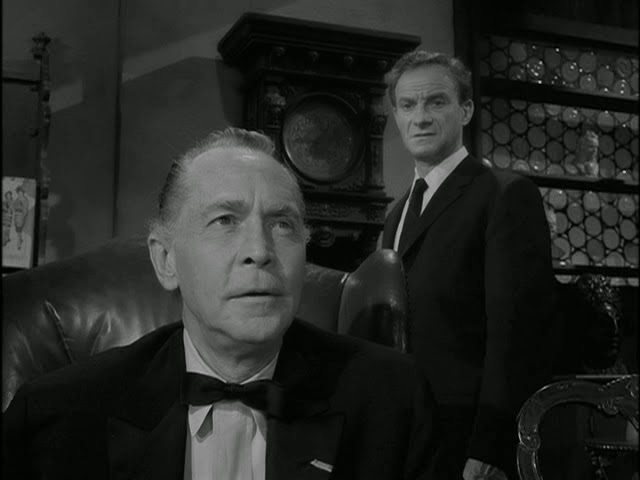 This live broadcast gave Franchot a very Boris Karloff like role. One with plenty of faces and mugging for the camera, smartly captured in mirrors throughout the set of the antique shop. Proving to be the veteran that he was by this time, Tone doesn’t break character when at one point a large bang is heard on the set and a full length mirror takes on a definite shaking as a result of some out of sight stage hand slipping up. The episode was directed by Robert Mulligan who would go on to helm some well received films in the decade ahead including To Kill a Mockingbird and Love With the Proper Stranger. 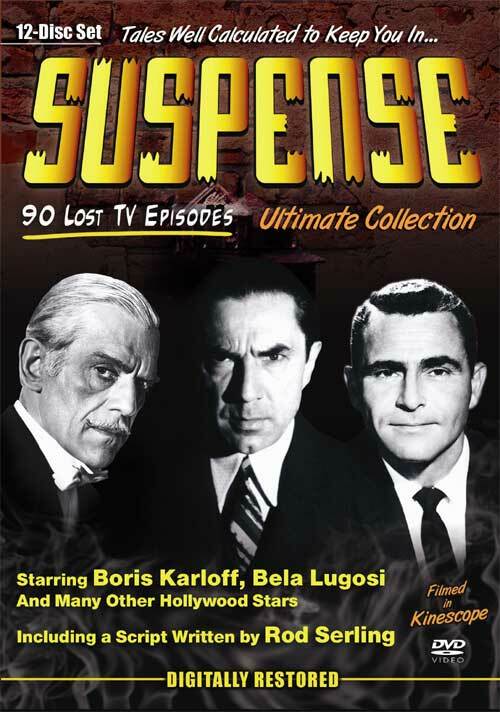 I have a box set of these Suspense episodes and this was the first one I’ve looked at. Quite enjoyed it so I’ll have to give more of them a try. As a senior member of a Men’s Club who carries some clout, Franchot Tone has little use for club member Liam Sullivan. A brash young member of the club who loves to boast and regale other club members of his monetary accomplishments, plans and schemes. He appears to be quite the conman and Tone calls him on it with the offer of a ludicrous wager. Long time vet, Boris Sagal (The Omega Man) directed this Rod Serling special that sees Tone offering a half million dollars to Liam for one year’s silence. Liam is to be housed in the club in a glass room with microphones throughout. Should he utter one word, he will be banned from the club for life. Sullivan accepts the wager and as the weeks turn to months and the pendulum continues to swing, Tone begins to worry that he’s made a poor bet. So much so that he’ll begin to taunt the younger man behind the glass walls with offers of a settlement and when that isn’t working he’ll intimate that he’s heard tell that Liam’s wife may have been unfaithful in his absence. Tone is quickly proving to be anything but the gentleman one would expect to find at the club. The younger man’s temperature is on the rise but he stands firm and continually points to the calendar and that the time is coming to an end forcing Tone to make good on his part of the wager. I couldn’t help but realize that it’s Tone who wanted some peace and quiet at his club but as the bet is prolonged, he can’t stop egging his rival on and becoming more mean spirited as the tale unwinds. 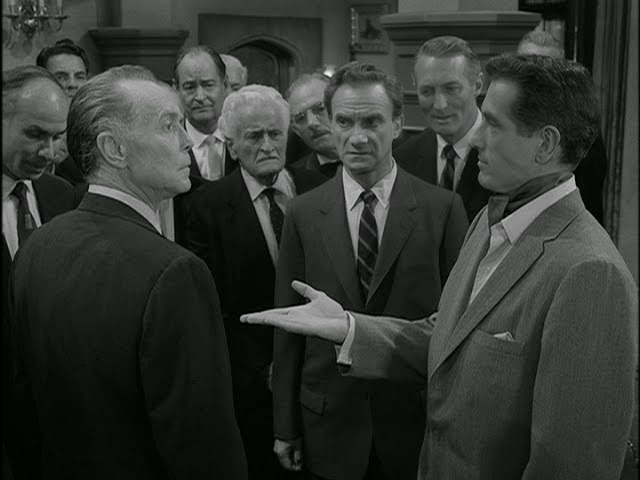 Not surprisingly, Serling will have a twisted outcome to the wager as the episode comes to a conclusion. Another fine episode in the cult favorite show that sees Tone well cast as a snooty member of the old boy’s club not taking kindly to the much younger man who possesses the gift of gab. Not only is this an opportunity to see Tone on the long running hit series, but it also offers film buffs a chance to see some of the later work from noted director Jacques Tourneur who gave us classic films such as Out of the Past and Cat People. Tone stars here as the title character, Denver McKee. 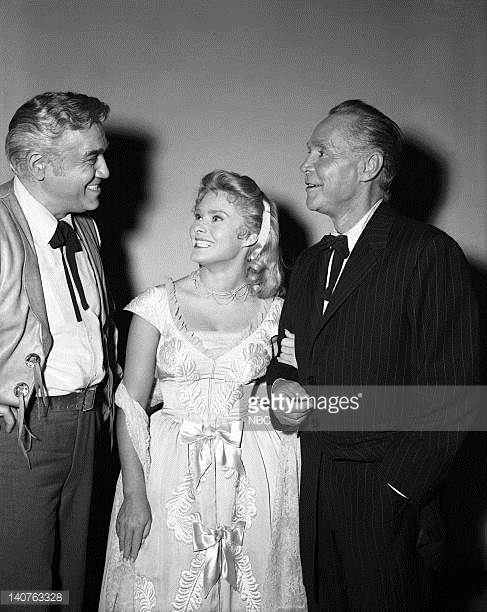 He’s a retired Marshall who lives near the Ponderosa and an old friend of Lorne Greene’s Ben Cartwright. He wants nothing more than to provide a good life for his daughter played by Natalie Trundy who has returned from the East a fully grown woman. Needless to say, Little Joe Cartwright has taken notice of that fact. Ben and the boys call upon Tone to aid in the hunt for a vicious gang of killers who have been raiding small time miners and leaving them for dead. At first Tone rides along but as the episode moves along, we’re to find out that he’s purposely leading the posse in the wrong directions. The reason? Tone’s pulling the strings of the outlaw gang and he’s quickly finding himself in way too deep. It won’t be long before the Cartwright clan piece the mystery together and the foursome will ride up to the Tone spread to face down the outlaws in a classic shootout. 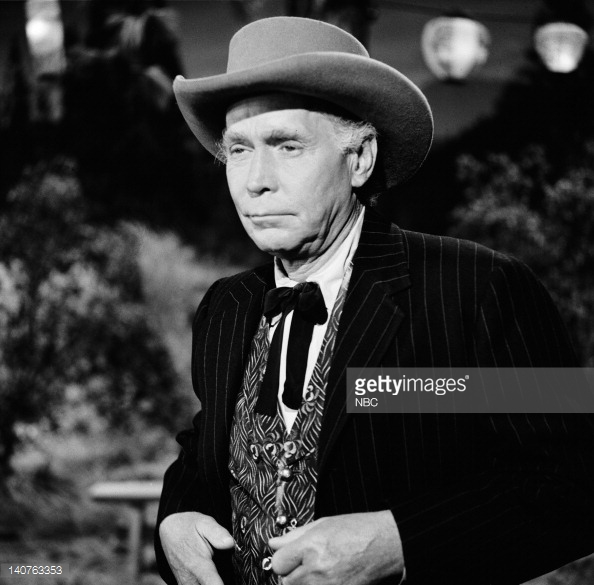 I won’t spoil the final scene in this one but it’s a darned good fade out for Franchot Tone on one of the most famous of TV westerns. Tone delivers an appropriately tortured performance in this outing. He’s a good man gone bad and he knows he’s let down his friend and his daughter. His two best scenes here are the closing one and an earlier scene where the always amorous Michael Landon comes a calling for his daughter’s hand. While not every Bonanza episode features all the Cartwright sons, this one does so both Pernell Roberts and Dan Blocker are in here as well. Long retired, most sci-fi fans will know Natalie Trundy from her association with The Planet of The Apes series. In fact, is she the only actor/actress to appear as both a human and an ape in the original five films? Makes for a good trivia question. Hopefully this not only spurs you to lookout for some of Mr. Tone’s later work on the small screen but to draw attention to the many actors who were at one time regular performers during the studio years on the big screen who would continue to find work and deliver noteworthy performances on the many shows that populated the early years of television and beyond once the 7 year studio contracts had come to a close. 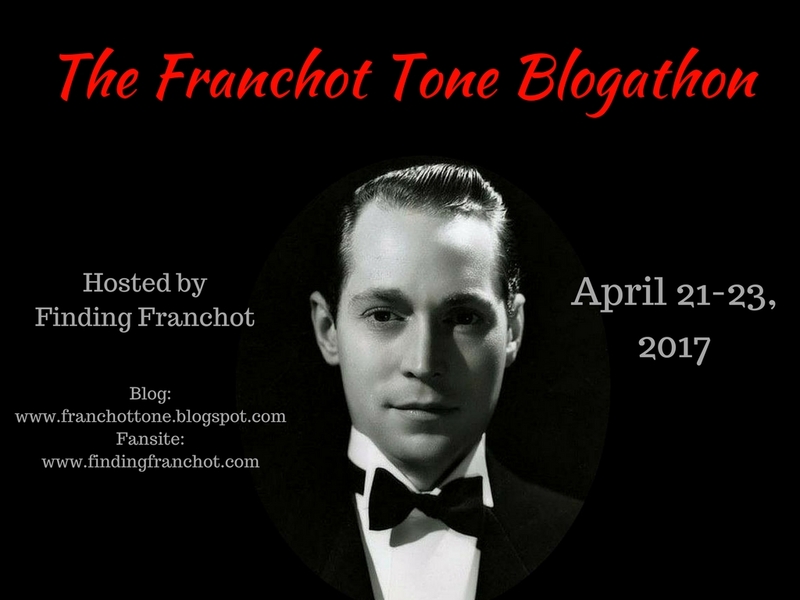 Please take the time to head over to read some of the other contributions writers have made on the many facets and performances delivered by Franchot Tone over his lengthy career. Great post! I recall reading years back that during the filming of that Twilight Zone episode, Tone was involved in an incident that left he left side of his face not exactly camera-friendly. That’s why he’s shot in those unusual but fitting poses where you only see the right side of his mug. Hey, it works for that episode, that’s for sure! Thanks . Maybe it was that pounding he took from actor Neal over Payton. Apparently it was vicious enough that it left him hospitalized. Never my favorite actor, alas, which is all the more reason why this is such a useful essay to me — many thanks for it, Mike. Totally agree so when I took this on this blogathon, was looking for a different angle and 3 classic TV shows proved fun. That 90 episode box set looks worth getting. I’ve seen the Twilight Zone episode and agree it is very good. There are plenty of “name” actors in there and while quality isn’t the best, at least they’ve been saved and they are the real early days of live broadcasts. Thanks for participating! Clearly, I’m quite the fan of Franchot on the whole, but my husband is not. He’s watched some films with me and while he doesn’t hate them, he’s just not that impressed.That being said, he really enjoy’s Franchot’s television performances. I think there’s an appreciation that can be felt for his television performances, even for those that are not sold on Dancing Lady-era Tone. I’ve yet to find a tv episode featuring him that is not well-acted, well-produced, and well-written. His television years absolutely produced some of his best work. I’m so glad you chose to cover these three in detail for the blogathon. Also, I never caught that large bang moment on the Suspense set, so I’m dying to rewatch it later today. I never put two-and-two together about where’d I’d seen Natalie Trundy before either. So many typos in my comment! I should’ve reread before posting. Alas, thanks again! That isn’t Tone as the watchman thought the cartoon could be mistaken for him. 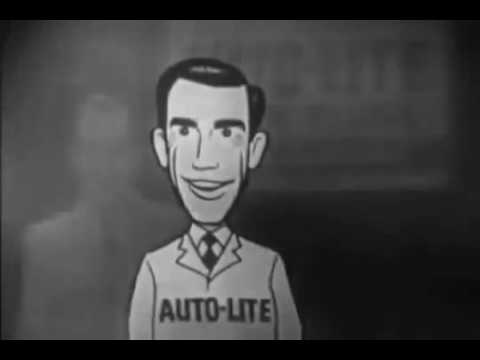 There’s an actual pitchman who delivers his sales pitch then it turns to a cartoon. Wow, this was interesting! What I liked the most is that Tone played a “Boris Karloff like role” in the first episode mentioned – this let me intrigued! Very good post, I learned a good deal. Thanks for checking this out and that episode was a lot of fun for an early live TV show. I’ve seen Dancing Lady years ago, at the time was focused on Gable and Crawford and had no idea that she married to Tone until I started to research more intently.